Chances are your inbox is full of emails from various companies touting their products as “the best ever” or “the answer to your prayers.” But how often do you actually open these emails? Half the time? Less than half the time? More often than not, these marketing emails go unopened—according to a study from GetResponse, the average open rate amongst all marketers is a meager 22%. A successful marketing email can be hard to come by, but if you work in this industry, fear not! Learn how to master the email marketing funnel and turn unanswered emails into consumer actions. 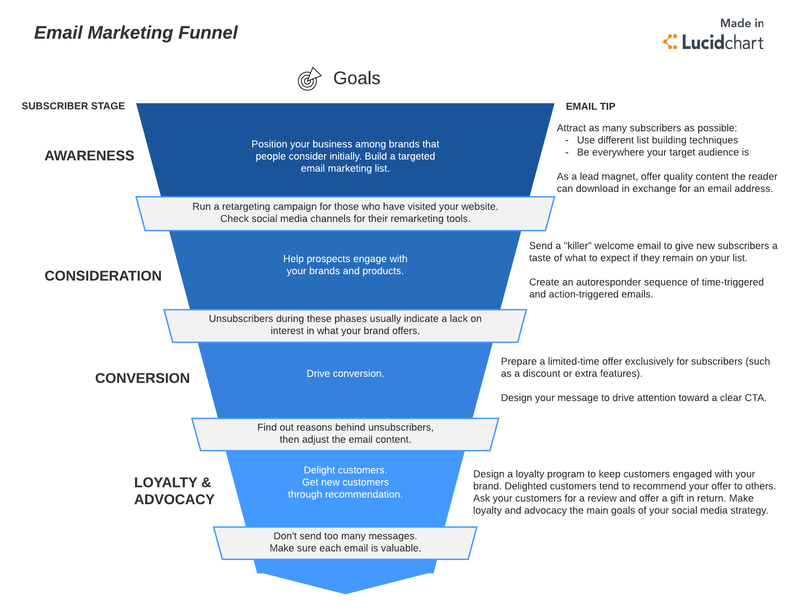 What is the email marketing funnel? The email marketing funnel visualizes the various phases in the customer journey (similar to the sales funnel and the marketing funnel we have discussed in previous posts). The funnel begins with product awareness, leads to a conversion or purchase, and ends with customer loyalty and advocacy, with other touchpoints along the way that turn potential customers into current customers. A solid email marketing plan includes content for the different phases of the email marketing funnel. If you tailor your email content to each stage in the funnel, you can improve the user experience and provide your audience with targeted, relevant content as they complete the buyer journey. . The first stage in the email marketing funnel is designed to cultivate awareness of your brand. Unless your company has the benefit of major name recognition, potential customers at the top of the email marketing funnel are just learning about your company, and therefore, detailed, product-specific content will just overwhelm the reader. In this stage, your emails should provide educational content to demonstrate the value , establish your company as a thought leader, and establish a relationship with potential customers. After you’ve made them aware, give customers a reason to care. Your emails will lead them to the consideration step of the funnel. A successful email campaign grabs attention with awareness and seals the deal with consideration material. After engaging with your awareness content, the potential customer should be intrigued enough to seek additional information. Give the people what they want! Leverage blog posts, webinars, or case studies help customers understand how the product works and why they need it. Include this supportive material in the emails, or provide links to your website for potential customers to explore. Lay out tangible benefits of your product or service—make them feel like they can’t go on without it. Target specific groups of customers and focus on the pain points your product solves. Create a need for your product or service. Put yourself in the shoes of the potential consumer and focus on what you would want to hear. This step is the crux of the email marketing funnel, and if you’ve done your job correctly, the content of your email will persuade the customer to make a purchase. This stage is all about striking a balance between convincing the customer to invest in your product and creating a sense of urgency. Sweeten the deal with a discount, free shipping, or another buying incentive. Remove any barriers to purchasing. Consider including “Buy Now” buttons in the email. Make sure the website experience matches the email content. And know when to call it a day. Don’t spam a new customer’s inbox with emails. A simple “Thank you for your purchase” and order update email are sufficient for this step in the email marketing funnel. It might seem like the hard part is over, but that doesn’t mean your job is done. Continue to nurture the relationship you’ve established with your new customer, and keep them engaged with supportive content.For example, if you just sold the customer a trip to Hawaii, you could send them a packing list or a list of popular attractions in the area. To remain engaged with your customers, send follow-up emails with workshops or tips and tricks on getting the most value from the product. The point of this step in the email marketing funnel is to reinforce the customer’s decision to buy your product and hopefully convince them to buy again. No one enjoys buyer’s remorse. Getting the customer to promote a product is the mark of a successful email campaign. If you’ve managed to inspire your customer to make a purchase, the next step is to turn them into a brand advocate. Social clout holds a lot of weight these days, and satisfied customers leave glowing reviews or share their recommendations with friends when they feel strongly about a product or brand. Keep track of customers who engage in repeat purchases. Send out-of-the-blue messages or perks. Give your new and existing customers reasons to keep believing in your product. 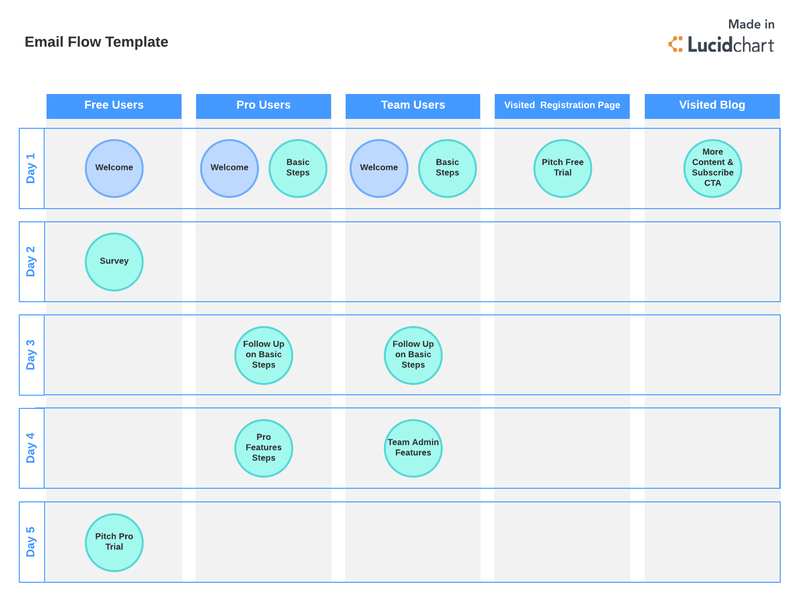 Use our free Lucidchart templates to organize your content for each step in the email marketing funnel. We encounter hundreds of ads every day— most of them get passed over without a second glance. However, an impactful and can change how we spend our time and money. So invest the time in planning your email marketing content to effectively speak to customers wherever they happen to be in their journey. A well-thought-out email marketing funnel and campaign have the power to turn browsers into shoppers and one-time fans into lifelong brand ambassadors. How will you shake up the traditional email marketing funnel? Get started with a customizable email marketing funnel template from Lucidchart and start creating content.